I never blogged about our “vacation” days in Omaha. See, insurance pays for Patrick and one parent to travel for care.. but if daddy comes, too, then we worry about airfare costs and sometimes that means staying a few days. We were beyond bored of our usual Omaha/Ronald McDonald House activities. So Brian declared that we should make it a vacation and try to find new things. Sometimes circumstances lead you to discover things you might not try otherwise. Like today I had roasted red pepper hummus, veggies, saltines minis and chicken nuggets for lunch.. something i may not have ever planned for lunch if not for short gut and oral aversion and food allergies. But back to travel. Brian did his homework and here are a few discoveries. One of the things that you may not guess about our family because I’m not exactly fit is that we are a fitbit family. Especially on vacation. Brian loves to walk. I love to walk with my family. And so we walk. So of course, when we arrived in Omaha, after unpacking and dinner, we went out for a walk. We heard often about a place called Old Market when we were living in the city. But it was brutal winter and bitter cold for walking and we were too poor and immunocompromised for eating out. So we didn’t go. Visiting Old Market was high on our list going back. It’s a pretty nifty few blocks of downtown Omaha. Lots of dining, some shopping, and on every other street corner, a musician. Not the creepy of musician begging on the street that you aren’t sure if you should cross the street. Just honest to goodness musicians with their instrument cases in front of them. A drum line. A girl in a flowy white skirt hula-hooping to her friend’s music. Patrick was in his adaptive stroller and we learned that the combination of cobblestone roads and staircases made this the trickier way to explore the street. (Most businesses had ramps on one side, but few had them on both.) But it was a fun adventure nonetheless. Maybe someday we’ll have time and money and healthy immune systems and we’ll find a place to eat there. A few caught my eye. Omaha boasts one of the world’s best zoos and, though we visit every trip, we never feel we have seen it all. It changes with seasons and because the habitats are so real, the animals in view are always changing, too. We spent Thursday morning there in beautiful weather on their spring break, so crowds were bigger and we stuck to more outdoor exhibits, caught the seal training, walked around the rhinos. Right before returning home in February, Patrick and I went for a drive. On a whim, I followed some historical markers and we ended up driving to a historic monument in the bluffs above Council Bluffs, Iowa. My little Utah heart that grew up looking down on the Salt Lake Valley from various vistas leapt for joy to find an overlook of Omaha. And I knew I needed to bring Brian back. So, Thursday evening, when we had just enough time for a drive after dinner, I directed Brian up to the monument. His reaction was almost the same as mine. And of course, Patrick did what he did last time. He started exploring. He noticed a set of stairs and a little trail going off to the side of the monument. We resolved to come back and explore that trail. Because we grew up in the Utah mountains and that is what people who grew up exploring mountains do. The next day, we packed a crazy little dinner of ham sandwiches and pringles and jell-o cups and we headed out in the late afternoon to explore. We set our watches and checked our fitbits to know how far we’d gone. And we started walking. We walked around this sometimes steep, often narrow and overgrown but clear train that followed the edge of the bluff. And then we got to where we could see the trail led down into the subdivision at the bottom of the hill. And we turned around and we went back thinking that it was nice, but a bit of a bust. On the way back, we learned that the actual destination was DOWN the bluff. Down a nice steep incline by the railroad tracks, at the base is a spring. So if you ever want to go hiking there and you don’t mind really steep trails, so explore. It was a bit too much for us with Patrick and my asthma that hates hills. At least this trip. But do go. Especially if you can go in early spring. That was the perfect weather for a hike. We picnicked overlooking the city. Patrick ate most of his ham sandwich. As much as most other kids would have. Of course, morning were still nippy so we didn’t want to hike in the mornings. Instead, we took a field trip out to Ashland, NE to visit the Strategic Air and Space Museum. My father-in-law is an engineer. He loves planes. My husband grew up loving planes. This is one he’s wanted to explore for a long time. And it was awesome to let him take his son and share that same love of planes. After spending the whole morning in the museum, we bought a parachute toy in the gift shop and Patrick and Brian took turns trying to get it to fly off in the wind on the front lawn. Then, we went and found the entrance to the state park next door. Didn’t go in, but bookmarked it for next time. We took a little drive through Ashland itself because we love small towns and were hungry. Then we took country roads back into Omaha. Again, hoping to find a quaint little place to eat. But we ended up at Five Guys instead. After several days of eating kids meal hamburgers (Yes, you read that right. Patrick, started eating burgers this trip.) this was one burger Patrick had no interest in at all. Kids and their tastes. Have I ever mentioned that finding little bakeries is a favorite foodie activity of ours on vacation? Donut and cupcake shops hold a special regard for us, especially. 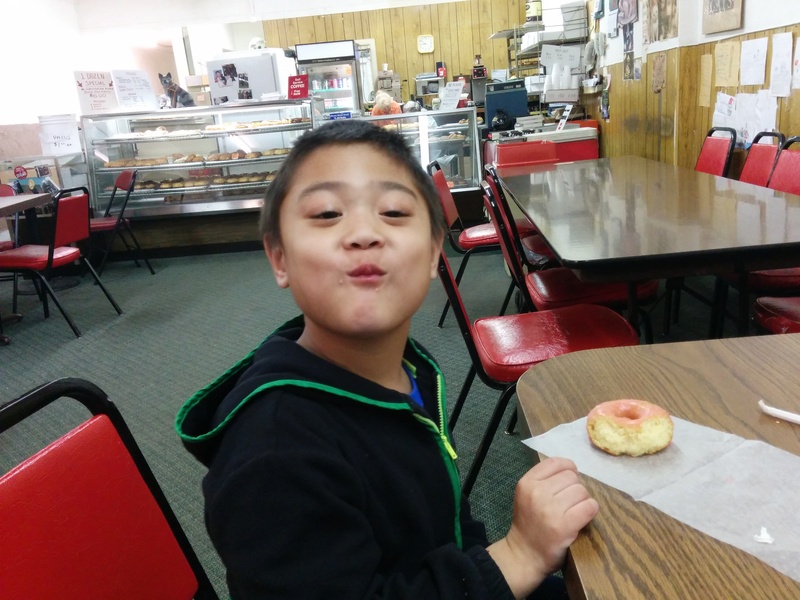 So when Brian found an all-night donut shop in Omaha, he knew we needed to go. After our hike above Council Bluffs, we took a meandering drive to our room through that city. And, along the way, Brian declared we were in the right neighborhood for donuts. I can’t really capture the essence of this place in words. It was NOT the seattle donut shops we have frequented. It opens in the evening and stays open all night till morning. The stop itself has two big display cases full of a decadent assortment of donuts. And behind the case, two little old ladies frosting trays full of donuts more for the night. Our order was rung up on an old fashioned cash register that popped up our totals on numbered tiles and dinged when the drawer opened. The walls were adorned with pictures and souvenirs from Hawaii and an abundance of pictures of cats. It was one of the most quaint and unique bakeries I’ve ever been into. We all think the donuts were amazing. Especially Patrick, who suckered me into letting him have his cake donut with pink strawberry frosting on it, even though I knew his belly might complain later. Saturday morning, we drove through the traffic of a St. Patrick’s Day parade. We needed a less busy place to spend the morning and Brian needed some more steps. There is a bridge that crosses the Missouri River from Omaha to Council Bluffs. There is also a park on either side, both of which are worth a visit on their own. But our goal this morning was to walk across the bridge. So, we grabbed some Taco Bell. (Waffle of the waffle taco was another hit for Patrick.) Then we bundled up against the Nebraska wind, put Patrick in his stroller and away we went. It was one of the colder days we experienced there so Patrick ended up wearing Brian’s hoodie. It was fun and peaceful to be out for a walk above a river. Even if Patrick was in a grumpy mood and didn’t want us to hold hands or push his stroller one-handed or do any other number of things that made him feel out of control. After a week of walking, I knew I needed to do more walking when we got home. I was sore and tired. But it was fun. And when we got to the Iowa side, we walked down in their park to the riverfront and let Patrick out to run for a little bit before heading back. For lunch, we met some friends at a park. It was one of the most perfect weather Saturdays of the year. The kids (with help from dads) played on the playground. And for lunch, we grabbed some pizza from one of our favorite unique-to-the-area pizza places, Mama’s Pizza. I highly recommend the chicken club pizza. Saturday, after enjoying an amazing roast pork dinner provided by volunteers at the Ronald McDonald House, we checked out of our room and moved to a hotel. We wanted breakfast and a smooth checkout since we needed to leave for the airport around 6 a.m. on Sunday. The original address we were aiming for was a different sculpture park that we really need to go and see on another trip. But we found our actual destination almost by accident and were so glad to make it there. Omaha was kind of a gateway for pioneers settling the American west. Especially Mormons. And many people know to travel back and visit Winter Quarters and the Mormon Trail Center. (https://www.lds.org/locations/mormon-trail-center-at-historic-winter-quarters). However, I think I’m going to add this park to my list of recommendations to those interested in that history. This is an enormous bronze sculpture of a pioneer wagon train. Yes, a train. Several wagons. It is HUGE! You look across the street and there is a herd of buffalo across the street. As I understand it, go a little further and you’ll also find a flock of geese. Anyway, I have never seen the varied stories of the pioneers that settled the American West so completely and emotionally depicted all in one place. This sculpture was amazing. And Patrick got to chase a bunny rabbit in the dark and jump off of slabs of rock. So we all had fun. We got back to the hotel and Patrick was greeted by the desk clerk with a gift bag full of toys. As we checked in, she asked what brought us to Omaha. She didn’t expect “transplant followup” as an answer. And she went out of her way to add some extra love to his day. People are amazing. So – There you have it. How to vacation/staycation on a dime while immune compromised in Omaha, Nebraska. It was fun to come back to the Ronald McDonald House each day and tell the staff about where we’d been or where we were going and hear the interest in their voices about the places we were discovering that they hadn’t even been to themselves. It felt so good to be doing something DIFFERENT while we were there. Making some memories of our own choosing there. Kind of claiming the city for our own. 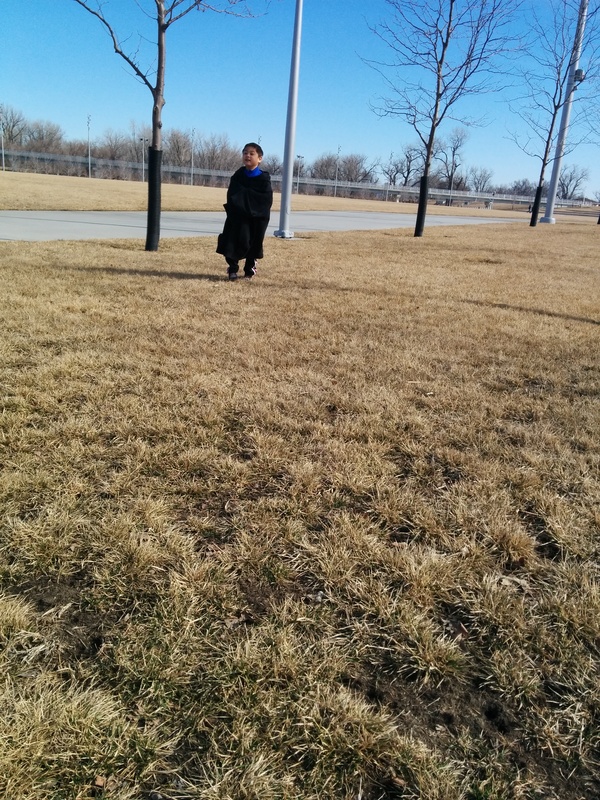 This entry was posted in Adventures and tagged clinic visits, family fun, Nebraska, Utah girl in Omaha on March 24, 2015 by geekino. 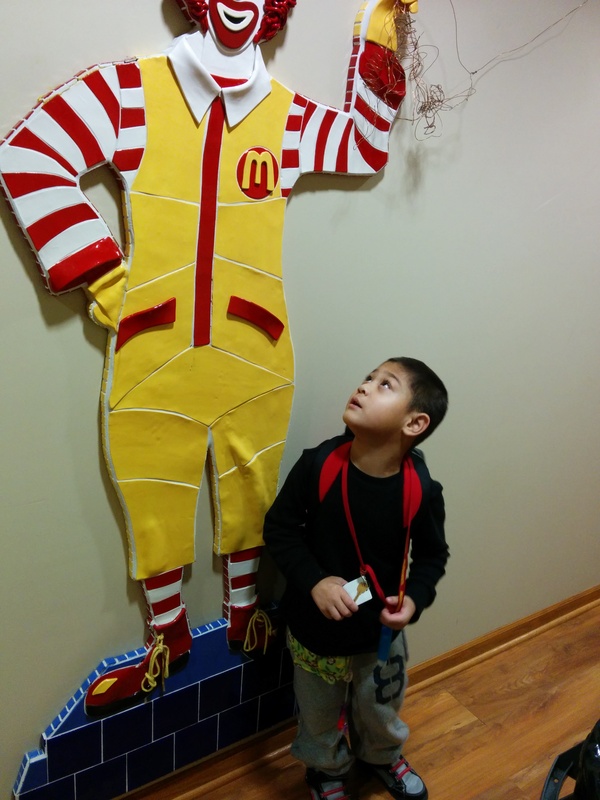 Patrick asked me to take this picture with him and the Ronald McDonald on the wall. Well, 72 hours since discharge as I’m writing this and I am amazed to say that today it seems we maybe hit our stride a little bit. Amazing, considering how out of control things still seemed last night. Sneaking back into the room last night after blogging, I noticed the distinct smell of formula and knew that it meant that Patrick’s g-tube had come open and leaked all over him and the bed. That woke him enough that I gave in and crawled in his bed to sleep last night. At 7, his pump alarmed, waking is both. It was an early morning, but meant we had time to get ready. It took some courage for me to figure out how to get Patrick a bath with his new ostomy without losing the pouch. Yesterday morning, I knew the pouch was about to fall off anyway so we tried it and, sure enough, I had to change the bag that afternoon. But today, we did a bath again and it was ok. Putting Patrick in the bath helps mornings go much more smoothly than showers. It means I can leave him for a bit. For example, this morning I was able to get the bed stripped so it could be washed. Patrick is chilled so easily right now. I don’t know if htat’s because his hospital room was so hot for a month and the weather outside is so cold.. But he gets shivers all over at the slightest cold. So I’ve started wrapping him in two towels. His calls this his towel dress and it is the highlight of his morning. Being up early this morning also meant I managed to get a shower in before the nurse came. And, amazingly, Patrick woke up feeling good enough to not need Zofran this morning. That will earn me an extra half hour of sleep every day. I didn’t feel lost looking at Patrick’s meds this morning. I kind of know what he’s getting and when and how much prep to do in the room before taking them downstairs. So after labs were drawn, we went downstairs and gave meds and mixed formula. (Which I remembered to make with warm water so it dissolved better.) And then I made pancakes. That felt like quite the luxury. Patrick ate 2 bites. Turns out we don’t love sugar free syrup from IHOP. Then I glanced at my phone and noticed I’d missed a call when I was in the shower. It was the transplant clinic asking if we could come in early for Patrick’s appointment today. So, we hurried off to run our one errand of the day, and then rushed to the transplant clinic. I am used to doctor’s visits where the answer is “you’re doing as well as you can. Nothing can change till after transplant.” Instead, today things were moving. Patrick’s prograf levels were still high this morning, but for fear of swinging him the other direction, they are leaving his dose the same. That means that he gets to take the morning off of labwork tomorrow and have it done Saturday, instead. Because he is tolerating feeds SO incredibly well, they are said that we can start giving him a break in his feeding schedule. We’ll increase his feed rate by 8 cc’s and he can have 2 hours off. If that goes well, then after the weekend, we’ll go up again and he’ll get 4 hours off. Because of the diproblems with his lungs, they will go very slow in transitioning him to a different formula. So he probably won’t gain much weight in the next little bit because he isn’t getting a lot of fat.. But slowly that can be reintroduced. Alas, the formula that they often use next has milk in it, so we need to take our time going to a hyperallergenic formula instead. And that’s that. We came home from clinic and tried to eat lunch. But Patrick was bored and sleepy, so he spent the afternoon napping and I have mostly just spent my afternoon laying here keeping him asleep… though I snuck out of bed to write this blog post. I finally realized today that I can write the post in a word processor and then just copy and paste when I go in a room that has an internet connection. It might mean some delayed posting, but should be a little more effective than trying to get away in a room with internet long enough to write. We were woken from nap by a phone call saying that dinner was ready. Patrick was still all over the place at dinner, but thankfully the crowd was small because he’d slept through the start of movie night at the hospital. Dinner is very overstimulating for him. So we usually retreat to our room early. Last night, we had good incentive. We’d picked up a Christmas tree earlier and I finally brought it into the room. We set up the Christmas tree and hung the ornament he’s made thus far on it. Then went and made two more. I cleaned out the room a little bit more. I think we may finally be almost moved in. I can’t even imagine moving houses with a kid this age. And then, we made it to bed. Patrick’s prograf levels must still be high because he just can’t fall asleep at night. Last night, he wouldn’t stop playing with his hands. I was really grateful for the chance to visit with an older transplant patient who is staying here. He explained that the prograf makes his hands shake, hurt, and even lock. Last night, Patrick wouldn’t stop playing with his hands. So I thought to ask him if his hands were hurting. The answer was yes. And so I laid there and rubbed his hands till he settled down. Then I told him I was just too sleepy to stay up with him anymore. I went and laid down and he was asleep in 15 minutes. We slept in till 8 this morning. No labs today. It felt luxurious. And now we’re downstairs letting him play in the playroom. Which means a little bit of internet time for me. Yesterday gave me hope. We had some downtime and I think that will get better the more used to this new routine. This entry was posted in Christmas, G-tube/Enteral Feeding, Holidays, Life as an SBS mom, Medications, Ostomy, Recovery, Transplant and tagged clinic visits, intestinal transplant, Ronald McDonald House, special needs parenting, transplant, trials and triumphs on December 12, 2014 by geekino.